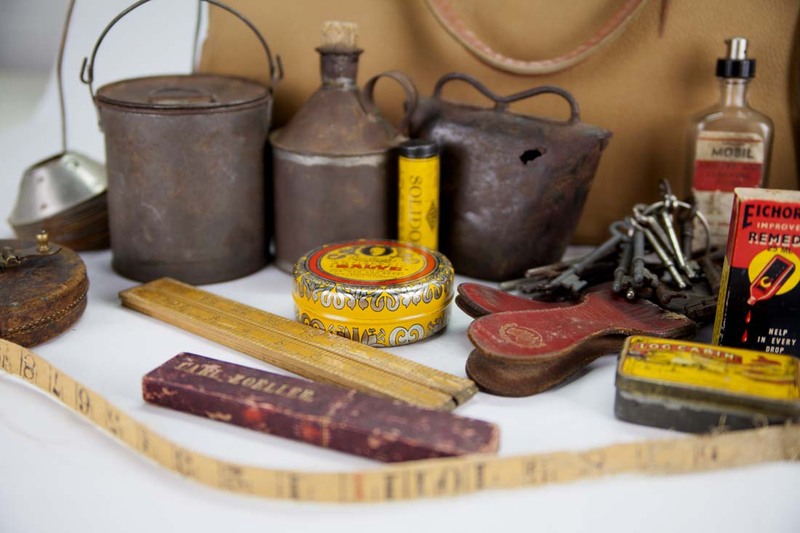 Bring back memories long forgotten, encourage a healthy curiosity and love of history, or relish the opportunity to see and touch items from “back in the day”. 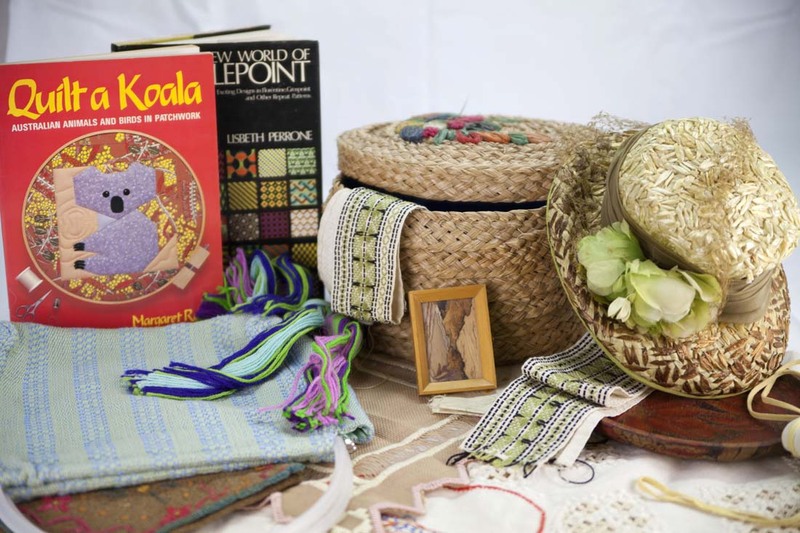 Reminiscence Boxes are themed collections of museum objects which may be passed around and used to prompt memory and discussion. Each box contains a range of multi-sensory objects intended to evoke memories and stimulate discussions about times past. Accompanying each box is a folder full of additional information about the objects contained within, alongside some fun trivia! These free resources are available for loan to aged care providers, community groups or schools. Each box is available for 2 week loan, subject to availability. For bookings contact the Museum of the Riverina Botanic Gardens site on 02 6926 9650 or send an email. This box will take you back to the pantry staples of many families in Australia, and whoever owned this one certainly had a sweet tooth! Plenty of favourites make the cut including Uncle Toby’s Oats, Arnott’s SAO biscuits, CSR Treacle, Colman’s Mustard, Bushells Tea, Pecks Paste and Bovril. 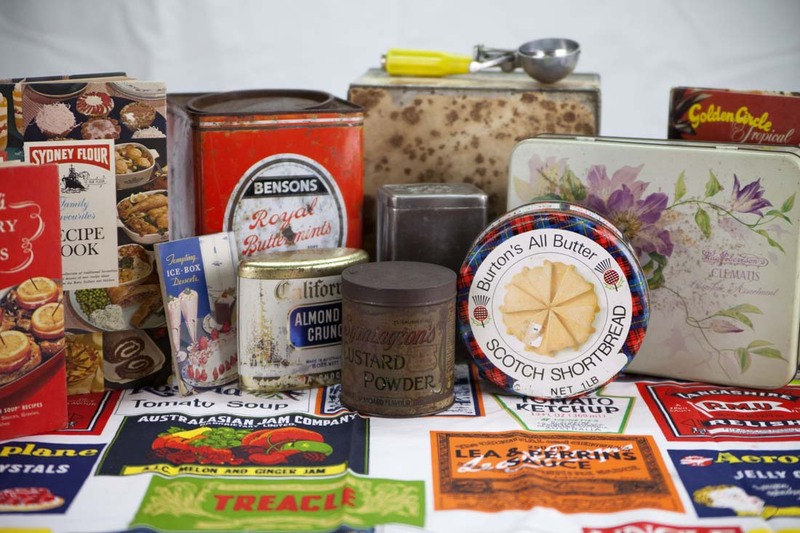 Take a look at tins once filled with toffees, chocolate boxes, and all sorts of ingredients used in desserts and cake-making. There are even some items still full (but please don’t open them!). One of the oldest of the textile arts, women have often whiled away their hours sewing throughout history. This box allows a look at a range of handcrafts passed down through generations. Did you ever make or wear clothes made from crochet? In this box, you will find a bright yellow dress, likely crocheted in the late 1960s or early 1970s. There’s also a Knitting Nancy, dating from the 1970s and used to create French knitting. This type of knitting was taught to children at home and in schools. During World War II it was used for making socks, placemats, scarves and even tea cosies. Other crafts in the box are still popular today including knitting, lacework, crewel embroidery, and smocking, while some remind us of times past. Pottering around in the shed is a proud pastime of many in Australia. Packed with all kinds of bits and bobs, there’s almost nothing you couldn’t fix with something lying around. This box will certainly bring back memories for many with a plywood box of Bryant & May’s Safety Matches, a billy can, cow bell, enamel tea cup and Salter Pocket Balance. And what kind of shed would it be without spark plugs? Don’t worry, there’s a tin of those too, manufactured in England by the by the Champion Sparking Plug Co. Ltd. The old tin of Zam-buk would certainly have come in handy. A healing antiseptic ointment which would have been used for cuts, bruises, scratches and insect bites, alongside a whole host of other ailments. If the Zam-buk couldn’t fix it, the bottle of Eichorn’s Remedy might have been called into action. Originally produced by August Eichorn and his wife firstly in Adelong, then at their home near Sydney, their main market was at the fairs and shows throughout the small country towns of NSW and Queensland. Swimsuits, togs, bathers – whatever you call them, they’re essential for a day at the beach and there’s a number of men’s and women’s styles in this box. The Pony Swim Ring was manufactured by American company Alvimar, who began producing inflatables in 1947, and continue to do so today. 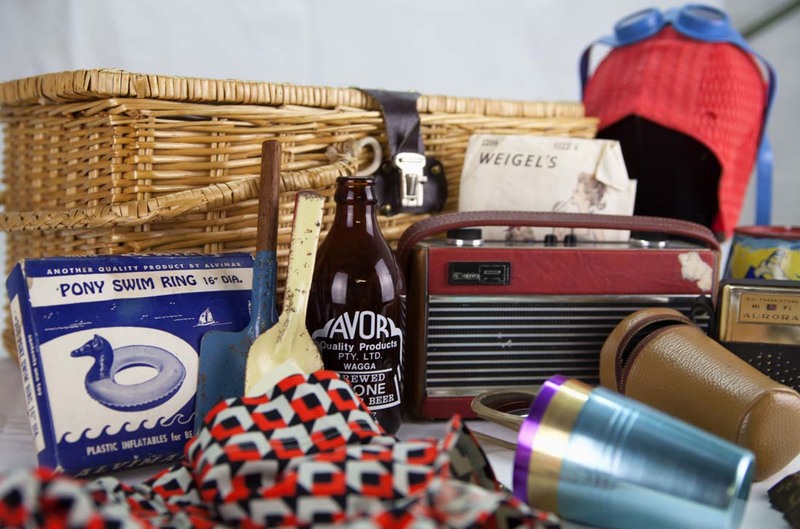 This box also has plenty of other beach accessories from a swim cap, beach towel and sunglasses, right through to a cordial bottle, cups and a radio.